The Emory Eagles head to Texas to compete in the opening rounds of the NCAA Division III Tournament, the team's fifth consecutive postseason bid. The Emory men's basketball team has earned the program's fifth consecutive bid to the NCAA Division III Tournament. Pairings for this year's 64-team field were announced Monday afternoon. Led by head coach Jason Zimmerman, the Eagles will venture to the campus of Hardin-Simmons University in Abilene, Texas, for a Friday, March 3, match-up against Texas Lutheran University starting at 5:30 p.m. (CST). Following the Emory-TLU contest, Hardin-Simmons University (HSU) will square off against LaGrange College at 7:30 p.m. The winners of those two games will meet on Saturday in a 7 p.m. (CST) tip. All games will be held at the Mabee Complex on the HSU campus. 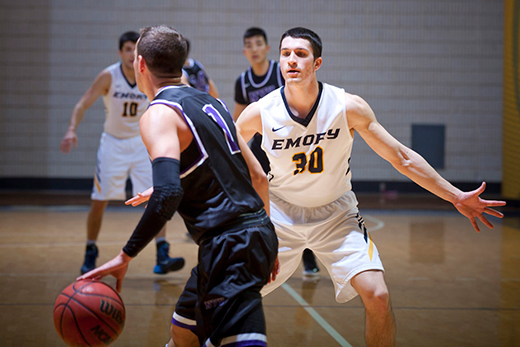 This year's postseason appearance will be the sixth ever in the history of Emory's men's basketball program. Emory landed an at-large berth after wrapping up the regular season with an overall record of 18-7, 9-5 in the University Athletic Association, which was good for third place. Last year, the Eagles advanced to the Sweet 16 round of the NCAA tournament. The Eagles closed with a flourish, winning their last four games. Senior Adam Gigax, who was chosen to the All-UAA First Team, paces the team's scoring attack with an 18.8 points per game average. Senior Jim Gordon, a second-team pick to the all-conference team, ranks second with a 15.6 per-game effort. Texas Lutheran is making its third straight trip to the NCAA Tournament after securing an automatic bid by winning the Southern Collegiate Athletic Conference. Friday's game will represent the first-ever meeting between Emory and TLU on the hardwood. LaGrange College is in the NCAA Tournament for the fourth consecutive year, punching its ticket after a title performance at the USA South Tournament. Emory holds a 19-6 edge in the all-time series with LaGrange, though the Panthers have won the last two encounters. Hardin-Simmons won the American Southwest Conference Tournament. If Emory and the Cowboys were to play, it would be the first meeting between the programs.